he also said "next" elsewhere in the sentence so I guess I transposed the words! I didn't know about the lead time on the preproduction cars once returned... Oh well. According to LilRedDave, they don't replace the module. They take the module and actually fix it to the current specs and then do all the tests again. So it will take a few months. 4409 being offloaded this morning, July 23 (it's morning from the shadows, and there were sightings of it being reported in the CP yard still yesterday afternoon). Only 43 days since the last delivery. Only 22 years, 311 days until they are all delivered at this pace. LMFAO, what a joke and STILL they are poorly built............garbage! What's the basis for them being poorly built? Most days recently (including right now), TTC has 100% of the vehicles received so far in service. If poorly built, wouldn't this be lower? Actually, their build quality is quite good. actually no. 4401 is still used for training. Back in April LilRedDave commented that the plan was for 4401 to go back to Thunder Bay in late August. So still here for a while ... I'd assume this date has only gotten later with the delays since then. It's not August yet. 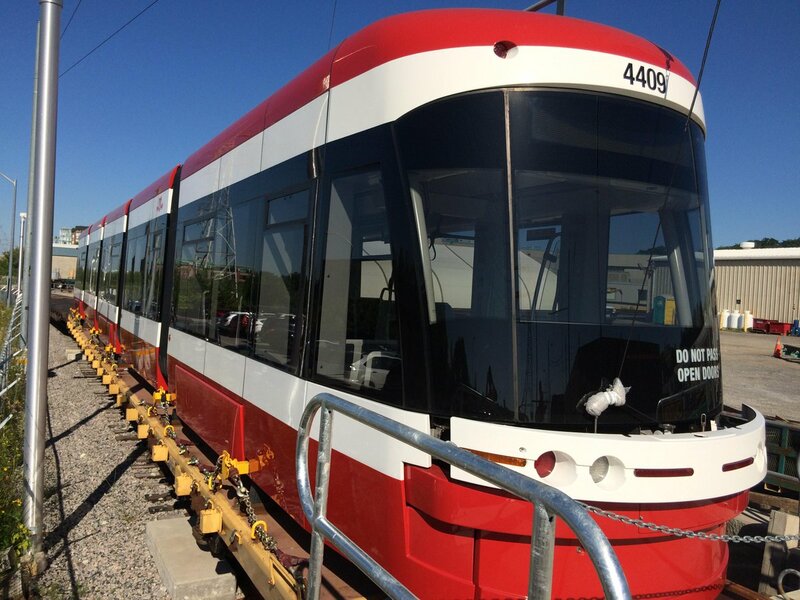 2 streetcars are to arrive in August. So 4401 can go back when 4411 arrives. Back in April, late August was much higher than 4411. Even in the June schedule, 4409 was supposed to arrive in late June (according to Byford's latest CEO report), so late August should have been 4412. Doesn't matter though. Clearly plan wasn't for 4401 to go back anytime yet. Though Bombardier and plans don't seem to go well together! And perhaps there won't be a 4411, given the option that staff just put in front of the board for terminating the contract with Bombardier for poor performance. Though I doubt that would happen. This could be an epic drama in TO if that really is to happen. Termination means TTC will have to repay for another prototype and retender out the contract. It can happen like TTC can cut back the number of Flexitys to purchase and buy the other half from Siemens or some other company. Although having two fleets is annoying but if Bombardier can't deliver 50 cars by next year, then TTC could consider this route as thta means they won't finish delivering by 2020. If it were not for they've just dropped hundreds of millions for the new Leslie Barns, I'd be thinking that it's a conspiracy to try and cancel the streetcars so that they could buy buses. I really don't think they would proceed with cancellation - yet at least. If Bombardier is still only rolling out one new streetcar every 45 days (8 cars a year) come winter ... then who knows. TTC will not buy buses to replace streetcars after spending billions to redo all the tracks, switches and overhead wires with or without Leslie Barns. Pretty sure they won't cancel the contract either cause another streetcar model means another prototype, new testing and training. Through the can just stick all the Flexitys they get at Roncy and tender for another streetcar for Russell and Leslie. All these hype is to get Bombardier to get moving but if 2 streetcar doesn't show up next month, Bombardier is really in hot water. Given how late 4409 showed up (more than a month since 4408 appeared), I have my doubts that 4410 will arrive within the first 2 weeks in August. It would be a miracle if they can deliver more than 15 cars this year at this rate. Nevermind how 27 are going to arrive. But Byford and Ross seems to be okay with their visit to the plant, so let's hope they get moving. Amazing how they seem to be able to churn out TRs and bi-levels, but just can't get the Flexity line moving. But maybe new designs they're not good at. I believe they've only produced one new cab car for GO. Well the logistics and suppliers are different, I assume, and that could be why there's a big difference in deliveries between the two. As for conspiracy, they could convert Lesile barns to Lesile bus Garage. Just dragging this conspiracy thing out longer. lol. If TTC doesn't do anything, Bombardier is just going to take this whole order as a joke. TTC is not going to cancel it, I doubt they can do anything significant to scare bombardier. They may even change their name to bid on the next contract, if indeed they are blocked from a future bid. i think you miss out the news that TTC was complaining about the workmanship of them and planning on putting Bombardier on black list to prevent them from future bidding on TTC orders...........100% in service? not including the ones being sent back to Bombardier right? "They are confident with the quality and reliability of the vehicles we have now, we just want more of them." Also, the "blacklisting" is due to the delivery schedule, not the "poor" quality of product they received. Most of the comments coming out of Byford and Colle about the streetcar order have been somewhere between political brinksmanship and outright lying. The cars that have been arriving here have been ridiculously reliable. But to say that Bombardier would have shipped 50 faulty cars by now, or that they've shipped back ones that were delivered poorly assembled is a lie. I might buy that if they had at least broken ground on McNicoll garage by now. IIRC the new cars are running like over 90% of the numbers between breakdowns. 4410 Entered service on the 510 yesterday. Says so on the TTC's press release.